Your support is the first step to curing blood cancers…. I was recently nominated by the Leukemia & Lymphoma Society to be their Woman of The Year! Yes, this nomination holds a grand “title” but it’s really all about giving back to something that I am extremely passionate about. Please join me in this journey and help spread awareness of the campaign. We really can beat cancer! All donations are greatly appreciated and are tax deductible. They’ll not only support LLS research but patient services, advocacy, public and professional education, and community services as well. The Man & Woman of the Year (MWOY) campaign is a spirited fundraising competition in communities across the U.S. in which participants build fundraising teams to compete for the title of Man or Woman of the Year. They raise funds for LLS blood cancer research in honor of local children who are blood cancer survivors, the Boy & Girl of the Year. Each dollar raised counts as a vote. The titles are awarded to the man and woman in each community who raises the most funds during the ten-week campaign; the top local fundraisers in the country also win the national titles. What are the rules of fundraising? The Leukemia & Lymphoma Society’s Man & Woman of the Year campaign is a national ten-week campaign to raise funds to help find cures for blood cancers. The campaign includes individuals in the community who agree to utilize their leadership abilities and resources to conduct their own fundraising campaigns to help The Leukemia & Lymphoma Society fund blood cancer research and provide education and support services for patients and their families. Before that ten week period, candidates may collect pledges. Pledging is a great way to accumulate the donations and sponsorships that will be needed in that 10-week period. As of April 6, 2017, I am now able to collect donations! You may become a sponsor with advertising opportunities for your company by filling out the info below and Alicia will contact you for a meeting. Sponsorship not only puts your company in the spotlight but you will automatically receive tickets and special seating at the grand finale for your group. Alicia has also put together some extra incentives for social media marketing for the different sponsorship levels. When is the grand finale and the announcement of Man & Woman of the Year? The LLS grand finale is June 16, 2017 at La Cantera Hill Country Spa & Resort. The evening includes catered dinner, an inspiring presentation, entertainment and the much anticipated announcement of The Man & Woman of the Year! How can I support Alicia in her efforts to become Woman of the Year? You can support her efforts in many different ways- by DONATING, sponsoring or even by joining her campaign and being a part of the team. Come to her events or even just sharing them on social media! What do I have to do if I join Alicia’s LLS campaign team? Good question! The truth is just by signing up and joining Alicia’s team makes you a part of this fight and noble cause….BUT you also have the option to organize events to help raise money, email contacts to broaden Alicia’s donations and resources, be a cheerleader or even by simply sharing Alicia’s campaign on social media you act as an amazing team player. You never know, one person could be that great connection and make a difference. Ok I’m ready! How do I join #TeamAliciaLLS? To join Alicia’s team and our fight against blood cancers, click on the box below and sign up today. What if I do not want to officially join #TeamAliciaLLS but I do want to make a donation? 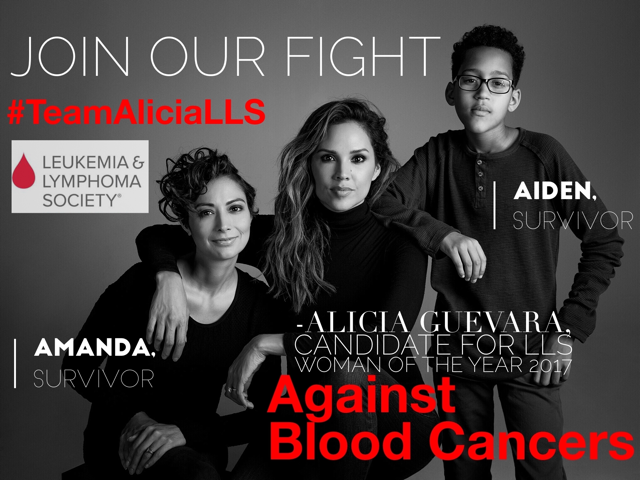 Just click the DONATE NOW button to make a contribution to LLS and Alicia’s campaign to becoming Woman of the Year 2017. Contact Alicia for any Sponsorships by filling out the form below.